Make your photos look their best. As holidays pass, we’re often left with dozens of cherished family photos. You certainly want to make them look their best, so here are a few tips for quickly getting dramatic improvements in Photos for Mac and iOS. When you do, Photos analyzes the picture’s pixels and does its best to improve the image’s overall brightness, contrast, and color. This tool also tries to identify areas that are in focus in an attempt to bring out the subject a little more, as well as make skin tones warmer and details sharper. Depending on the picture, you can end up with richer and more vivid colors than you started with, as shown the example below. The Enhance tool works particularly well on photos that are a little dark and lack contrast, like the tulip image shown here on the left. In some cases, a single click of the Enhance button may be all your picture needs to look better and brighter, like the right-hand image here. To glean a little insight into what the Enhance tool does, click the Adjust icon to open the Adjustments panel and take a peek at the sliders in the Light and Color sections that appear. (To expand those sections and see all the sliders they contain, hover over the section title and click the downward-pointing arrow that appears.) In your image’s original, pre-Enhanced state, all the sliders are positioned in the middle of each section. By taking note of which sliders the Enhance tool changed, you can manually adjust them to amplify the correction. While the Enhance tool can work wonders on some images, it can’t fix ’em all. When you use this tool, Photos makes its best guess as to what kind of correction your image needs, but it can’t guess at the picture’s content or the photographer’s intent. In other words, the Enhance tool can’t tell if you’ve captured an overexposed image of a brightly colored flower or a well-exposed image of a pale flower on a cloudy day. If the image needs more fixing than the Enhance tool applies, reach for the more targeted and powerful controls offered by the Adjustments panel. Just click Adjust at the right of your photo to expose its numerous options, or press the A key on your keyboard. To learn how to use the adjustments tools in the iOS version of Photos, see this article. Many of it controls work the same way in Photos for Mac. The Enhance tool is a one-click wonder; it doesn’t have any additional controls. That means you can use it while you’re cropping a photo or applying a filter, for example. You can easily apply a customizable dark edge vignette to any picture. Just open an image in Edit mode and then click Adjust (or press the A key on your keyboard). Next, click the Add button at upper right and from the resulting menu, choose Vignette. Use the Radius slider to change the size of the vignette or rather, the size of the area over which it’s visible; drag it right to make the vignette bigger or left to make it smaller. Use the Softness slider to control the width of the transition area between what is darkened and what isn’t; drag it right to increase the feather effect, thereby making the transition wider and softer. Click the blue circle with a white checkmark to toggle the vignette off and on to see a before and after. A dark edge vignette (bottom) gives your portrait a classy and elegant final touch, and helps tone down a distracting background. Photos for Mac has a secret keyboard shortcut that helps you assess your edits by with a Before and After view of your image—that way you can see how much the picture has (hopefully) improved. However, even if you root around through Photos’ menus, you won’t find it. The trick is to use the M key on your keyboard (iPhoto used the Shift key instead). To see the before version of an edited photo, press and hold down the M key; release the M key to see the after version. Be sure to memorize this keystroke, because you’ll use it a lot. Photos is riddled with useful keyboard shortcuts. 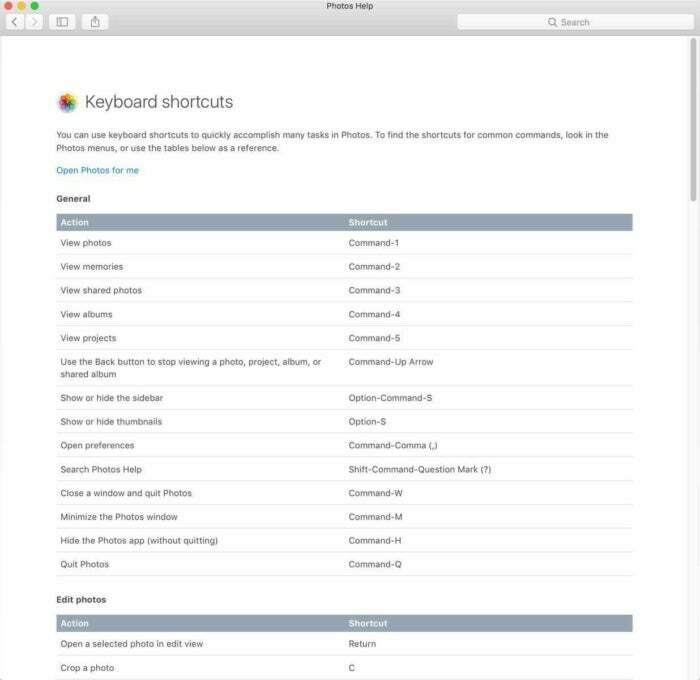 To see a full list, choose Help > Keyboard Shortcuts, and then in the Photos Help window that appears, click Keyboard shortcuts. You may want to print the list and keep it on your desk. When you’re finished, just click the red circle at the window’s upper left to close Photos Help. To save time when working with lots of images, print Photos’ list of keyboard shortcuts. These are just a few of the powerful image-enhancing features in Photos that give you professional-quality results in seconds. In my next column you’ll learn some power-user tips and a way to copy the adjustments from one photo onto other photos. Until next time, may the creative force be with you all!